The glorious – and funny – truth about the Power of Will is that you decide how much you have. And how much of your Power of Will you use every day. There is a self-fulfilling prophecy in your use of the Power of Will. When you say, “I can’t,” you’ve already sealed the deal. While it is true you may still make an attempt, You know it is also true that you are doomed before you begin. On the other hand when you say “I can,” you give yourself a fighting chance. When you say to yourself, “I can and I will,” you are already more than halfway there. When you repeat to yourself, “I can and I will,” several times throughout the day you are predicting your own triumph. And when it comes to the matter of developing your willpower the same holds true. When you think about your will every morning, and make a decision as to how you are going to use your Power of Will – and then follow through over the course of the day that you have made into your own, you are becoming a person with a powerful will. And if you’re willing to place doubt to the side and simply practice developing your Power of Will on a daily basis you are using the self-filling prophecy of the Power of Will as an engine to deliver your dreams. Developing your Power of Will in this manner is simple. It is easy and it is fun. In a very short time you become comfortable thinking of yourself as someone who possesses the Power of Will. 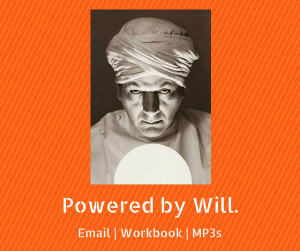 You become accustomed to using your Power of Will. You are comfortable achieving results with your Power of Will. And when you practice this simple, self-fulfilling ritual for 21 days, you will find that you have become a person who is confident, happy and determined to achieve your goals. And that’s all it takes. Understanding the self-fulfilling aspect of the Power of Will. And deciding to put it into practice. 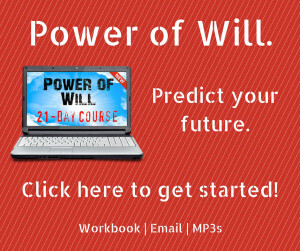 Our 21 day course in the Power of Will is the easy way to change your life in less than a month. It is affordable. It is here now, waiting for your decision to begin. You have it in your power to predict your future. It begins today with your decision to begin developing your Power of Will. Click here to begin your journey in will development or use the convenient button below this message.